Sweet flying canaries will look great in her hair. This is a double stacked bow that has a yellow 1.5" grosgrain ribbon on the bottom, then 2 orange shimmering sparkle ribbons that are 3/8" wide running through the middle. 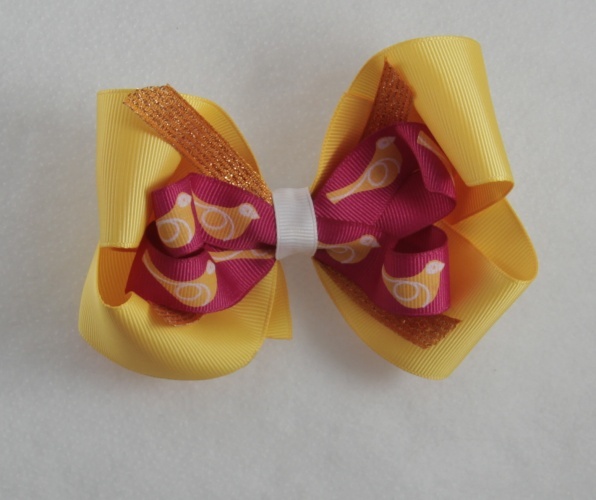 The top bow is a hot pink 5/8" wide grosgrain ribbon that has yellow gold birdies in a row. They have white wings and that matches the white grosgrain 3/8" ribbon that wraps the center. This bow is on a French clip.